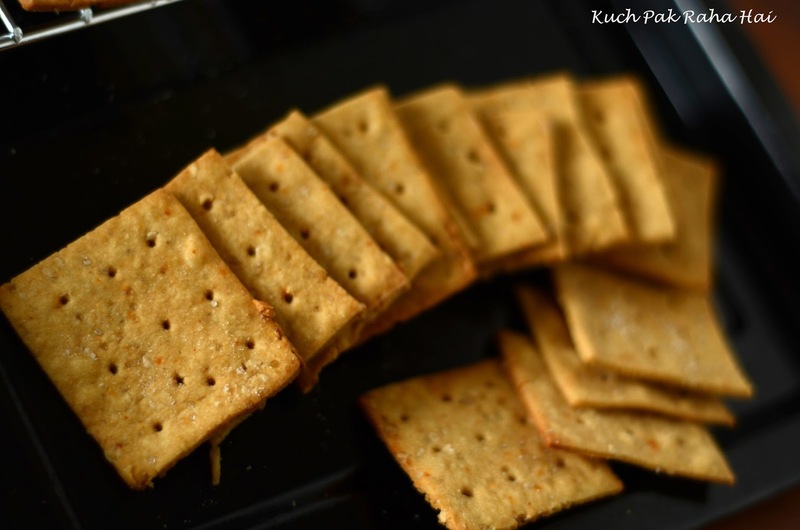 Whole Wheat Crackers or whole wheat thins are crispy, tasty and delectable snack which is liked by people of all ages. As the name suggests, these are made using whole wheat flour and baked in oven/OTG till golden brown. 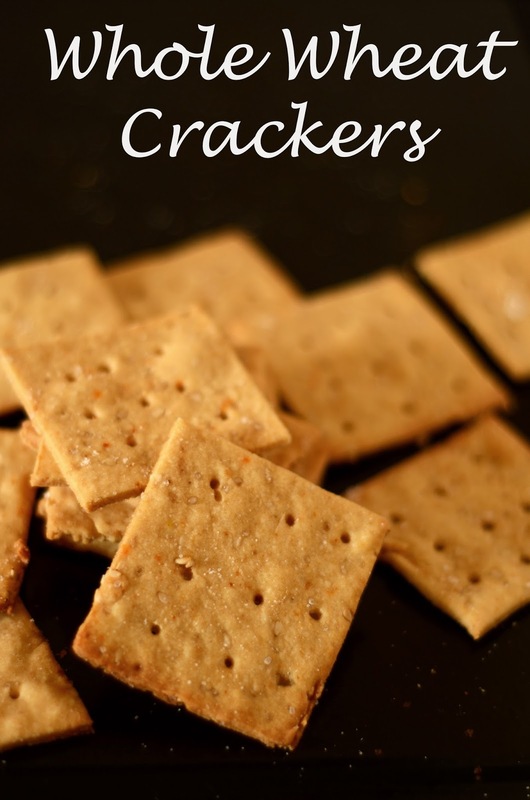 The crackers taste sweet and salty to the palate with crunchy texture. These days market is flooded with various snack options which are either unhealthy, loaded with lots of preservatives/stabilisers or even if healthy, they are heavy on pockets. 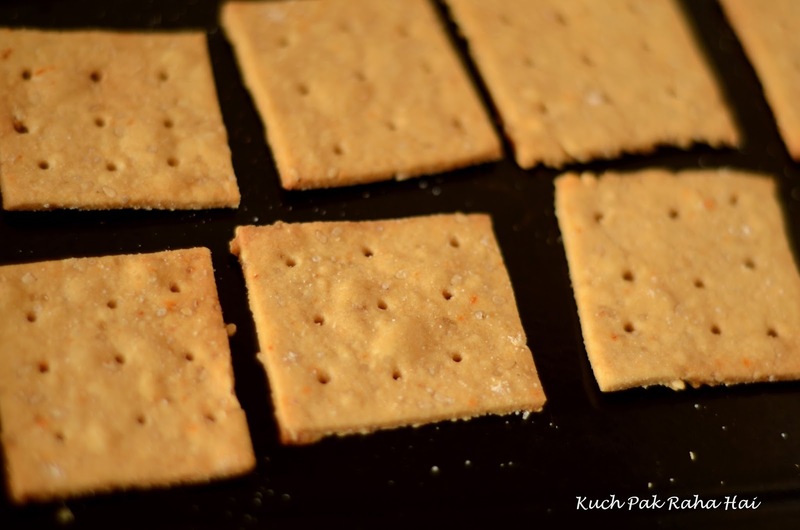 This whole wheat crackers recipe comes to the rescue when you want to feed your family some healthy snack and at the same time want it to be within your monthly budget. 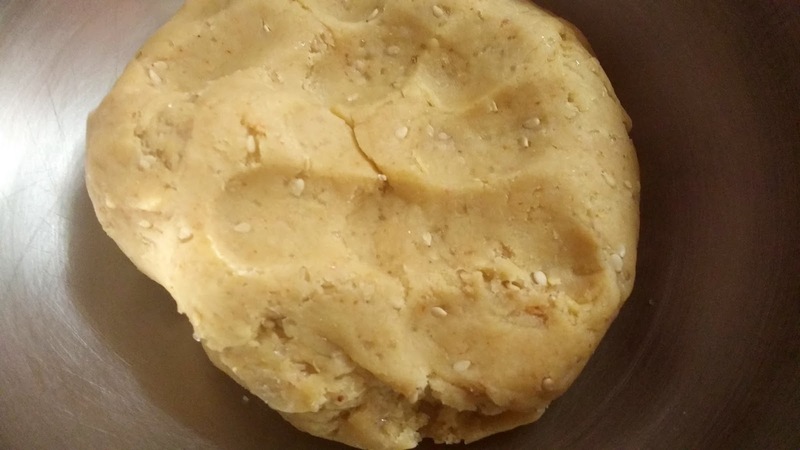 It is a kids friendly recipe which can be given to them as snacks, in tiffin or served in birthday/kitty parties. It is a non-fried snack and free from all the food colours, chemicals or preservatives which are generally present in kids' snacks available in market. 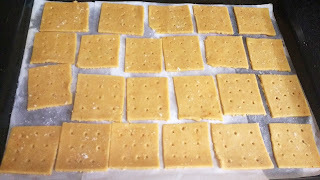 Just a few simple ingredients and you will have a box full of delectable wheat thins ready in your home!! The recipe is inspired from Smitten Kitchen Homemade Wheat Thins. You can check out the original recipe here. 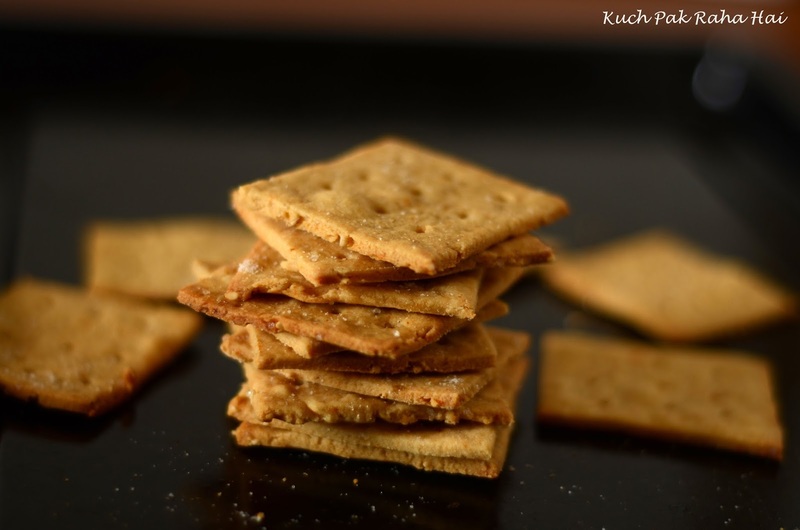 All the ingredients used in this whole wheat crackers' recipe are the ones which are readily available at home. I have kneaded the cracker dough using milk and added some sesame seeds to it. Children are quite fussy when it comes to drinking milk which is an essential source of calcium. 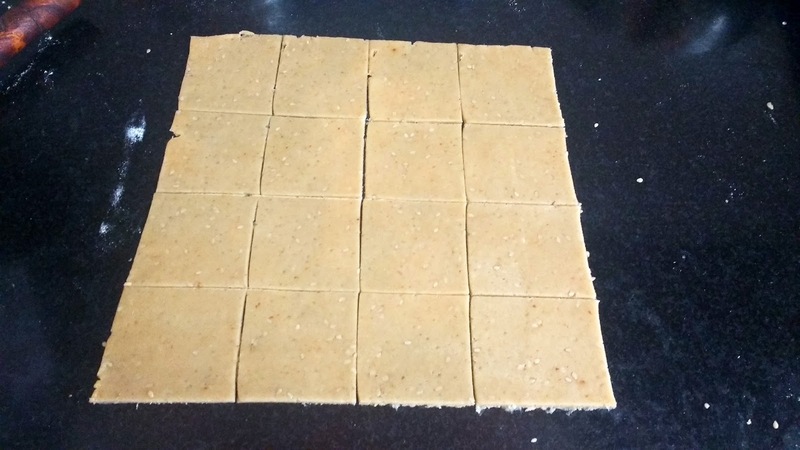 By adding milk and sesame seeds, these crackers fulfills some part of their daily calcium requirement. Also, Sesame seeds are a great addition to everyday diet as they are a rich source of omega 6 fatty acids, vitamins, dietary fibre and anti-oxidants. Along with it, they also contain, copper, magnesium and zinc etc. 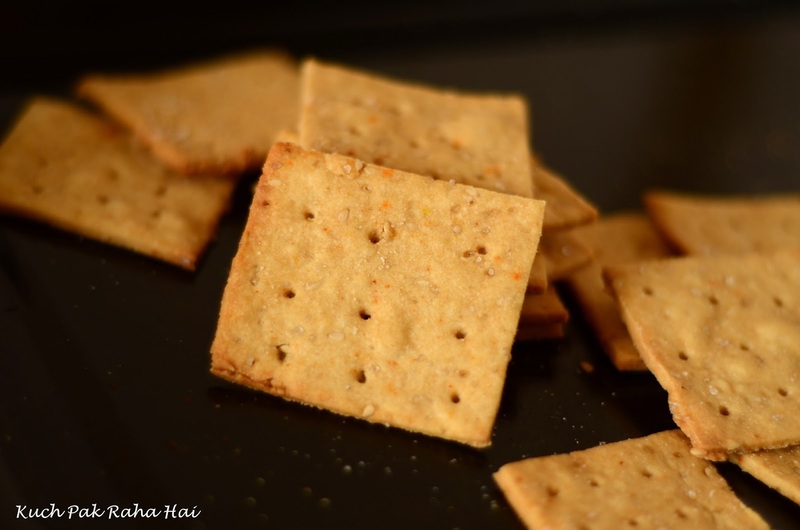 Hope you would like this simple whole wheat crackers recipe!! Take whole wheat flour, salt, sugar, chilly flakes, sesame seeds and cold butter in a mixing bowl. 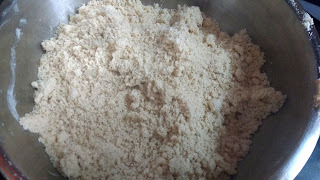 Rub the cold butter in flour till the mixture starts looking like bread crumbs. Add chilled milk to it and start bringing the ingredients together using hands or spatula to form dough. Don't knead it too much. 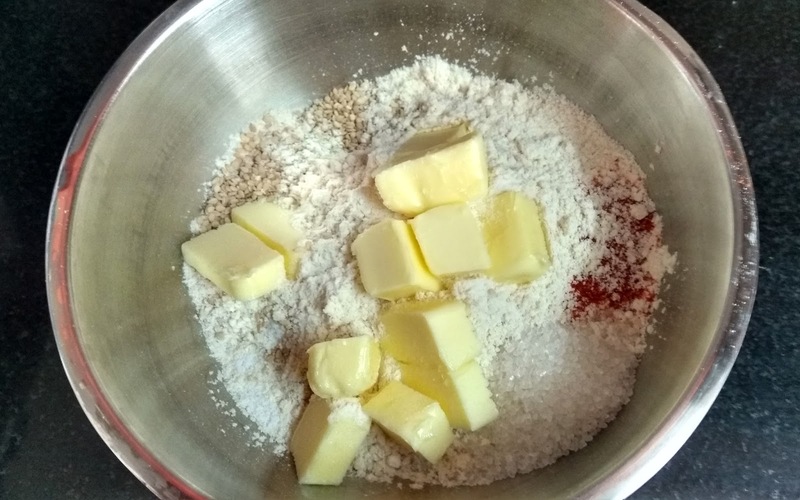 If the dough is crumbly, add 2 tbsp water or milk more to it. Cover the dough using wet kitchen towel or tissue for 5-10 minutes. Set the oven for preheating at 200 degrees Celsius. In the mean time, let us proceed to next step. Dust some dry flour on the rolling surface. Start rolling the dough for crackers over it. The dough should be rolled as thin as possible. 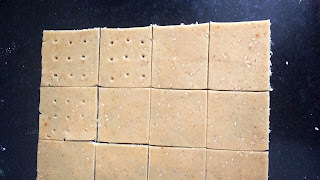 Start cutting the crackers in squares or circles using a cookie cutter or a scale. 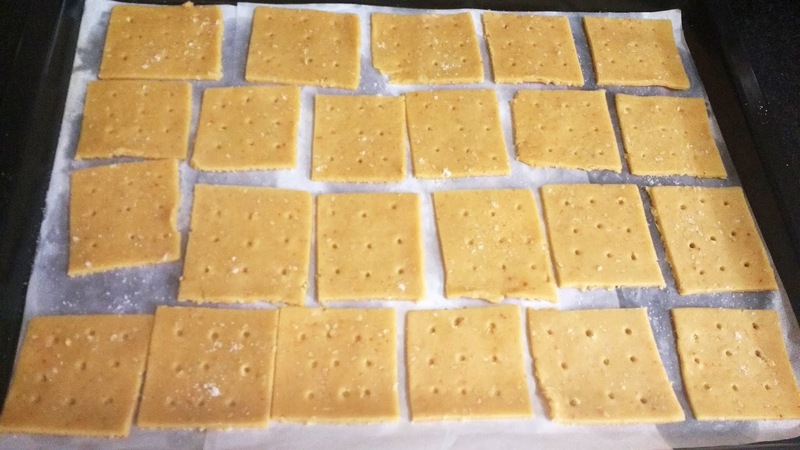 I have used a scale to mark 2"x 2" crackers. Make holes into it using toothpick/knife/fork. This is required so that crackers don't start rising and remain thin & crispy. Here I have made these holes using back of a toothpick. 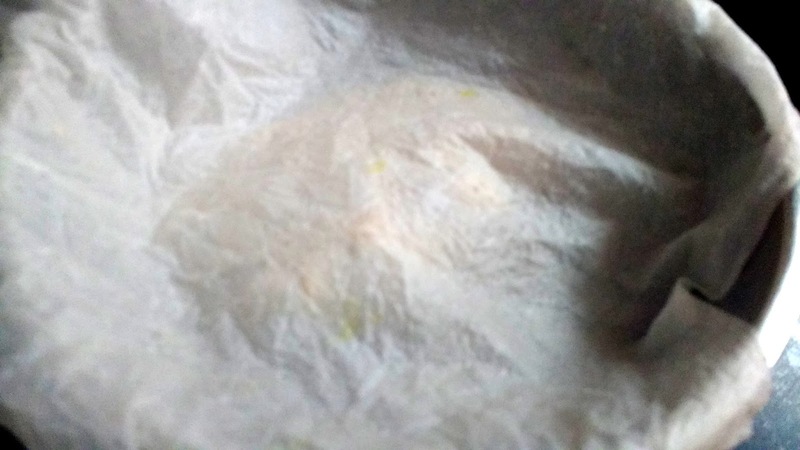 Place a parchment paper on a baking tray. Arrange the cut out crackers on it. Sprinkle some salt over it. Please don't skip sprinkling the salt as I personally feel they make a huge difference to the final taste. 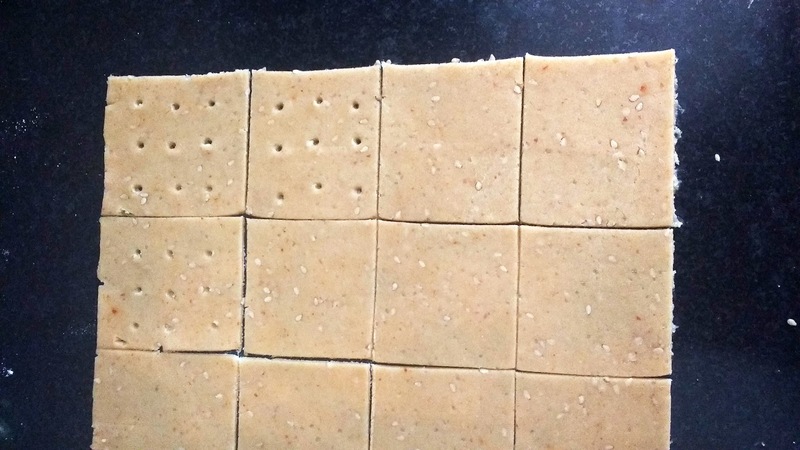 Bake these crackers at 200 degrees Celsius for 10-12 minutes till golden brown. Keep an eye on them as they burn really quickly. Once done, place them over a wire rack for cooling down. Enjoy these healthy delicious sweet & salty crackers with hot steaming cup of ginger tea or coffee.